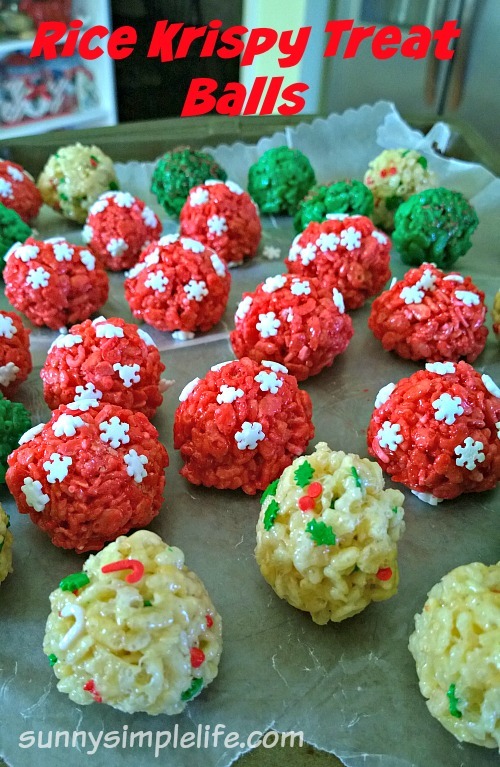 Rice Krispy Treat balls are a fun colorful way to change up the usual rice krispy treat idea. We made these for an ugly sweater party and they were a hit. 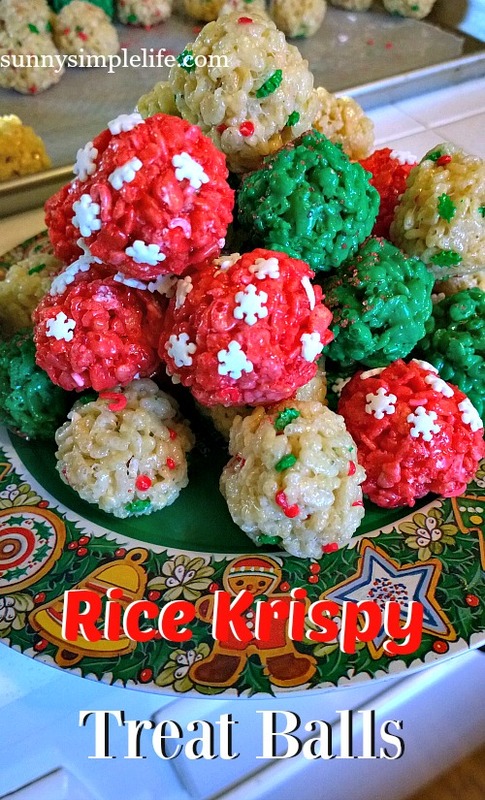 The rolling into a ball keeps the krispy treat nice and moist. We will make these for Christmas day as well as a perfect Christmas buffet dessert because you can eat with your hands. A fun party food you can just pop in your mouth. You could customize the colors for any holiday dessert idea. For each batch melt butter and marshmallows stirring constantly over low flame. When melted, remove from heat and add the food coloring stirring well. We needed more of red than we did of green for the green batch. Then add the rice cereal and stir quick. A cookie scoop made this so much easier. Onto a sheet of wax paper, hubby would scoop these out and then I would shape and make the balls and sprinkle with various Christmas sprinkles. For the white batch you will use three cups of cereal, marshmallows and three tablespoons of the butter. You can mix some sprinkles right into this batch to jazz the white balls up. Just let them cool at room temperature and then plate them up. I love these because they are so colorful. I like the sprinkles you used, too. It's such a gross day here today that I might see if the girls want to make some and watch Hallmark movies.